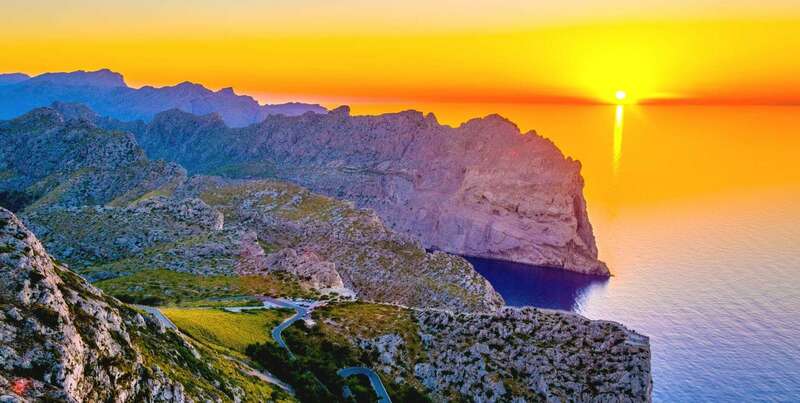 North-West Mallorca offers the island’s best walking – it is where the rugged mountains of the Tramuntana Sierra plunge into the sea, and picturesque villages perch on the slopes. You will walk on old paved mule tracks winding through wooded valleys, between terraces of olive and citrus groves, and along the high trails above the coast. This spectacular walk follows well-signposted trails that link some of the island’s most picturesque towns and villages – Sóller, Pollença and Valldemossa – where you stay at charming hand-picked hotels and enjoy time for long dinners of tapas and wine. Arrival at Valldemossa, a small town built around an old Carthusian monastery which proudly remembers the year in which Frederic Chopin and George Sand wintered here. Valldemossa can easily be reached by public bus from Palma de Mallorca. Your first walk starts directly from your hotel. Leaving the village of Valldemossa, you reach an area with restricted access where a limited number of permits are granted each day to walk the Archduke’s Trail (Camí de s’Arxiduc). We will arrange this permit for you; should there be no permits available, you will follow an alternative route nearby. Both options include sweeping views and an optional ascent to the peak. After a short transfer, you walk from the artists’ colony of Dei­a to the coastal town of Puerto Soller. Your route follows the coastline, through quiet Mediterranean woods (pines, oaks and madrone trees) and across a private estate where the owners serve delicious fresh orange juice. After a taxi transfer to Cala Tuent, a village with a lovely beach, you begin your walk. Your first follow the coastline to Port Soller and then pass the farm at Balitx d’Avall, situated among orange groves and olive orchards in one of the most remote valleys of Mallorca. From the port, you will male a steep ascent to the cliffs which form a natural breakwater overlooking the bay. At the top, you have lovely views from Torre Picada along the rocky coastline to the tiny island of S’Illeta just offshore. From the peak, you do a steep descent along a ravine to reach Sa Punta Llarga, a promontory which offers a lovely vista point back from sea level. Transfer to Lake Cuber in the morning. Today’s route is, without a doubt, the most beautiful stage of the GR-221 which takes you via the pass of Coll des Prat (1195m) to the remote Monastery of Lluc. The walk begins along the lake and once in the dense holm oak forest, the ascent starts: quite tough at first (but luckily still in the shade), later gentler, once you have passed the treeline. You’ll enjoy spectacular views over the island as you ascend. You reach the pass below Picu Massanella (the second highest peak in Mallorca). Next you do an equally panoramic section behind Galileu Peak, followed by a descent along the restored stone footpath known as Las Vueltas del Galileu. The final section traverses a holm oak forest on your way to the popular pilgrimage site at Lluc Abbey. You’ll have time to see the Black Madonna (patron saint of Majorca) before your taxi transfer you to Pollenca in the late afternoon for a short journey to your charming accommodation in the town centre of Pollença. A shorter option is to start walking from the monastery of Lluc and from there walk to Pollença. After yesterday’s demanding route, today you can choose between two short walks in coastal areas. The easier walk enters Boquer Valley, a small nature reserve for birds with a private beach. As a bonus, you will end your walk with a stroll along Port Pollença’s beautiful seaside promenade. The longer walk starts in Cala ses Barques. 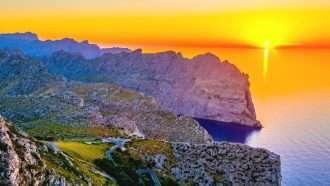 First you follow a wide gravel track west to a peak, Puig d’Aguila, with splendid views of Formentor Peninsula and the coves of Sant Vicenç and Port Pollença. Then you retrace your route back to Cala ses Barques and Cala Sant Vicenç and cross over to Port Pollença via Siller Pass. Both walks offer the opportunity to stop for a rest at lovely beaches, and both routes end in Port Pollença, where you get the bus back to Pollença. At the end of the day you may wish to explore the town of Pollença or enjoy the hotel’s beautiful grounds including a swimming pool and lovely gardens. Your trip comes to an end today after breakfast. Accommodation is in charming 3 and 4-star hotels, some of them with swimming pools. All of them have private en-suite rooms and offer a warm welcome to walkers, traditional hospitality and delicious local food. We have carefully hand-picked all places and regularly monitor their quality. We have tried to choose accommodations that offer friendly service, clean and comfortable rooms and local flavour. 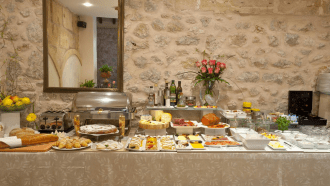 Family run hotel located in the centre of the town of Valldemossa, 15 minutes away from Palma de Mallorca. Built over the base of an antique traditional house and renovated with everything the visitor needs to enjoy some relaxing and nice holidays. The location offers the unparalleled landscape of the town surrounded by high and lush mountains. Small 4-star hotel located in a privileged part of the Puerto de Sóller bay; just separated from the seafront by a promenade, away from the traffic, noise and stress. With spacious and modern rooms, comfortable and elegant in style, most of them offering sea views. Charming rural hotel located in the centre of Pollensa. The hotel comprises several 17th century houses, fully renovated and ready to be the best option of rest and comfort for the holiday. Breakfast is included on all days. When no restaurant location is available on route, lunches and snacks should either be bought from local shops, or packed lunch can be pre-ordered from your hotel the night before. You have plenty of options for dinner in the villages and towns. The nearest airport is Palma de Mallorca (PMI). It is the main airport in Mallorca and has direct flights from most major airports in the UK and flying time is just over two hours from London. If you fly to Barcelona Airport (BCN) you can travel by ferry to Palma de Mallorca. Arriving by plane to Palma de Mallorca airport (PMI): there is a shuttle bus (line 01 or line 21) which runs from the airport to the bus / train station in Palma de Mallorca every 15 min. From Palma city centre there regular bus line 210 to Valldemossa (travel time: 30 min). Check timetables at www.tib.org. Arriving by ferry from Barcelona: from the Transmediterranea Terminal take a city bus (Line 1) to the bus station near Plaça de Espanya. From there, you travel by bus to Valldemossa (Line 210). From Palma de Mallorca airport (PMI): You can take the bus from Pollença to Palma de Mallorca (Line 340). For more details www.tib.org. You can go from Palma de Mallorca to the airport by shuttle bus from PLaza de España. Check timetables shuttle bus here. A private transfer by taxi from Port Sóller to Palma de Mallorca costs around 70€. From ferry harbour: If travelling by boat, you can get a taxi from your hotel to the ferry terminal. Direct taxi transfers from the last accommodation to the airport or harbour can be arranged in advance. Important: If you are travelling to and from Barcelona by private or rental car, you can the ferry to Palma de Mallorca. However, it is not at all convenient to take your car over to the island, as the cost is quite high. In addition, at the end of the trip it is faster and easier to get back to the ferry terminal by public transport or taxi than by car. All luggage transfers when changing hotels (Days 3 and 6) are included (maximum one piece of 20 kg per person). This trip is graded as moderate overall and many of the walks are optional or have shorter alternatives. Most of the walks follow gravel and paved tracks, and you occasionally follow minor roads (read more about difficulty grades). Some of the walks are waymarked with signs for the GR221 or other local paths, and we will provide you with detailed road notes, GPS tracks and maps. We strongly advise you to follow the trails and never try to shorten the path through the unknown and unmarked terrain. We will provide you with detailed road notes and maps, and you can call our 24/7 local assistance phone number anytime. More detailed info on route navigation will be included in your holiday information pack. You can start on any day of the week, subject to availability, between February 15th and December 15th. The weather is very pleasant and spring-like most of the year. The months of June, July, August are hottest and it is important to keep hydrated and wear plenty of sunscreen. The best months to travel are May and September, when the temperatures are nice and pleasant for walking. Flowers will also be in full bloom in May. The flexibility of self-guided holidays means that there are no fixed dates and you can start your trip on any date during the season.